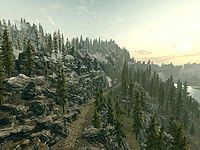 Haafingar is a relatively small hold in northwest Skyrim, containing the provincial capital Solitude. 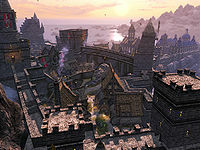 As the home of the provincial capital, Haafingar is the center of Imperial rule in Skyrim. It only becomes Stormcloak-run if the player joins the Stormcloaks and completes the entire quest line, including both The Battle for Fort Hraggstad and the Battle for Solitude. Haafingar is dominated by a large ridge that runs the length of the hold. Pine forests and meadows cover the southern slopes down to the Karth River, while the north side is colder, and dominated by mountains and frozen coastline. Solitude itself sits on a massive natural archway that extends over the mouth of the Karth from the eastern spur of the ridge. Haafingar's coastline is ideal for the growth of nordic barnacles and clams in the water and canis root and spiky grass on land. Near Solitude, fishing can be enjoyed around Solitude Sawmill where dragonflies play over the water. A fair amount of nightshade plants grow inside the capital. Mora tapinella, mountain flowers, and thistles can be found in the lower parts of the hold while only snowberries and sporadic mountain flowers can be found in the snow-covered tail of the Druadach Mountains. All locations in Haafingar with individual map markers are listed. There are a few places without map markers listed for their significance. 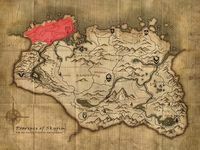 * Though located well within Haafingar's borders, the location is marked as belonging to Falkreath Hold. In addition, many miscellaneous quests, such as favors, are located in Haafingar. They are listed here.